Now booking school groups for the 2018 season! Let us help your students #GROW! At our project site, located at Two Rivers Park, we are building the city's first sustainable agroforestry public park space. Here, we're integrating lasting food systems into the landscape with the goal of creating abundance for both wildlife and people in our community. The public is invited to be active participants in this process through field trips, volunteerism, and other programming we offer. Our space is truly a "living laboratory" where students can identify problems and join us in finding solutions! We're all about trial and error, the scientific method for learning! GROW is a place to try out ideas, discover the fine balances of the ecosystem, and understand how our own human activities have direct effects for earth systems. Botany: Parts of the plant, plant life cycle, flower dissections, interdependence of plants and animals, heredity, seed production/collection/saving/germination, invasive plants and their removal, identifying native plants, edible flowers, herbs, permaculture farming, aquaponics (growing plants on top of a body of water containing fish), plus many more! Honeybees: Intro to beekeeping. This lesson affords students an overview of what beekeeping is all about and includes the chance to inspect (take apart) an empty hive and consider how it replicates the honeybees’ natural environmental needs. While we do not currently have our own honeybees located at the project site, we hope to have them moved by spring of 2019. Urban Wildlife: Identifying animals that occupy urban spaces (from back yards to pocket forests like ours.) We can go many directions with this topic, from conservation, to their role in the food chain, to study of individual life cycles and habitats. This is where collaboration with teachers really comes into play. 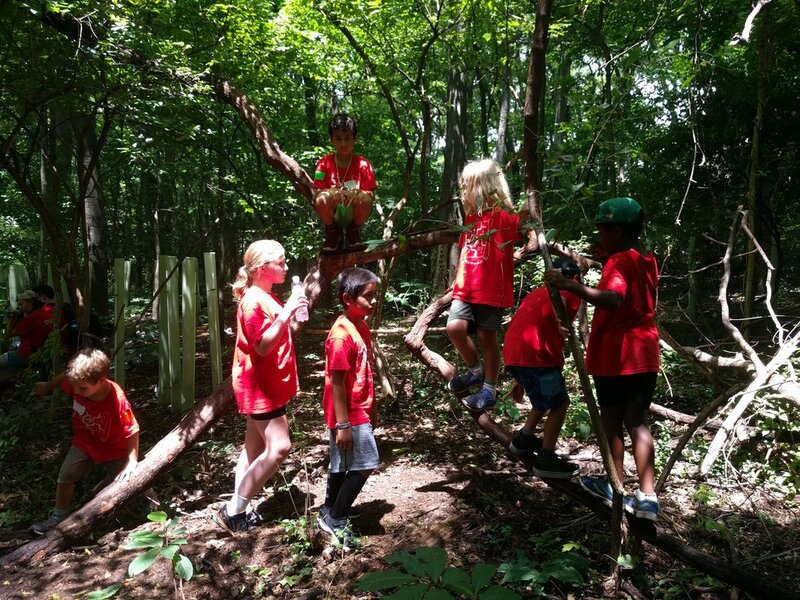 At GROW, we can accomodate full grade levels of students with a broad overview visit where students get to visit all the major areas of focus (urban forest revitalization, silvopasture orchard, demonstration gardens, and nature play/learning area.) Most groups utilize this as a first visit experience, a sort of "Intro to Ecology and Environmental Sciences" lesson. It can be adapted to groups as young as kindergarten, all the way up to the high school level. We can customize field trips for individual classes to help students achieve specific academic learning goals. Our project is broad-ranging, covering multiple types of ecosystems and a wide variety of standards-based science objectives. We are happy to work with teachers on an individual level to offer engaging experiences which support their own work in the classroom. These kinds of field trips are best approached with smaller groups of children, such as an individual class. They allow for a much deeper level of engagement on a small area of focus. No field trip to GROW is complete without some free time in "Kidlandia." Kidlandia is what we call our nature play area. Here, kids make the rules and take an active role in caring for the forest system. They also build forts, climb, dig, and explore. There is a wide, well-marked, trail which winds through it (built by kids!) and plenty of self-directed learning opportunities. Kidlandia is also a vibrant wildlife habitat, being home to white tailed deer, red foxes, opossums, racoons, little brown bats, barred owls, and more. We seek to help children understand that we can "share" urban forest spaces with them by leaving it better than we found it and allocating areas that we leave undisturbed. Be sure your group plans ahead to build-in time for students to explore this magical place! If you are interested in booking a field trip to GROW please submit the form below and a member of our team will reach out to you!